A beautiful bar containing Geranium essential oil and Rose Otto. Rose Otto is captured by steam distillation of the fresh petals. Pure, distilled Rose oil is regarded as the most precious among all essential oils. Its production is a very long and difficult process. 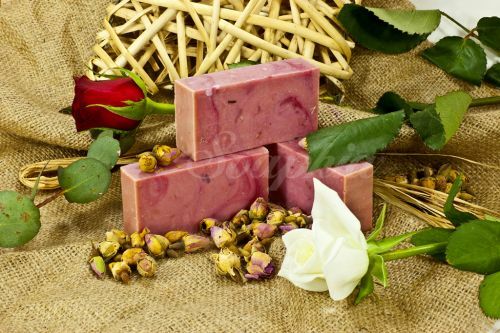 More than 30 rose flowers picked by hand yield only one drop of rose oil; more than four tons of rose petals must be distilled to produce a kilo of oil. The blossoms must be harvested before dawn, so that the delicate aroma won’t evaporate in the sun. Weather and storage conditions also very much affect quality and yield. Humidity in particular can damage the petals, therefore distillation must take place within hours of picking. With the traditional steam distillation technique, about half a ton of freshly picked flower heads are mixed with one-and-a-half tons of water in a still. The petals are then hydro-distilled and the oil and water is collected. The top layer of the distillate is separated and the remaining liquid (rose water) is then re-distilled separately. her zaman doğallıktan yana biri olarak çok güzel olduğuna eminim.